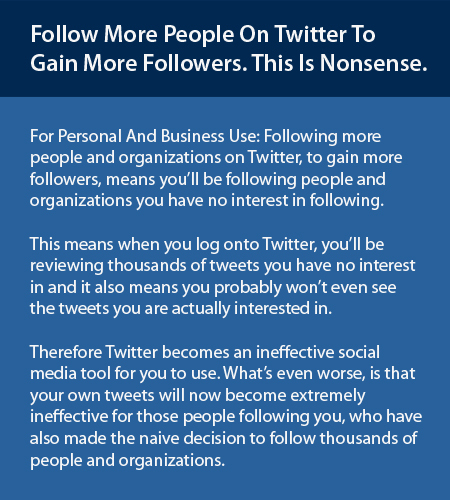 Twitter: A Good Social Media Tool But To Follow More People To Gain More Followers, Is Complete Nonsense. (San Diego, California, USA): If you are are a Twitter user (for personal or business use) or you are thinking about getting a Twitter account, then I recommend this article. Twitter is a nice social media tool because one can follow individuals (from friends to the famous), companies or organizations and get information, pictures, videos, thoughts, commentary, gossip, jokes, news and more, right from the source - 24 hours a day. If you know what Twitter is, you're welcome to skip the next paragraph. For those who don't know, Twitter is a social media program that can be accessed on your computer or through an app on your smart phone. It's easy to use for both personal or business use. When you log onto Twitter, you can scroll down and down and read all the posts from the people you follow without having to open each post. (Twitter is easier to use than email because unlike email, you can read each individual Twitter post, as you scroll down through the posts without having to to open each one.) Each post has a maximum of 140 characters and allows one to post text, links, pictures and videos. However, one of the oddest things about Twitter, is that Twitter officially recommends that every user should follow as many people as possible, so that you can gain more followers. I think this is complete nonsense. 1) First, because the more people you follow, the less posts you will see from the people you are actually interested in following. If you have lots of posts you don't care reading about, then why even use Twitter?. 2) Second, your posts become extremely ineffective to those people who are also following thousands of Twitter accounts because they most likely won't see your posts. 3) For a business, having over inflated Twitter followers is misleading to your customers and you'll have false numbers when evaluating the effectiveness of Twitter for marketing purposes. The point of Twitter, in my book, is that you choose those who you really want to follow, that way, you actually have first hand information from people or companies you are genuinely interested in. If one follows thousands of Twitter accounts, Twitter becomes useless. In my opinion, Twitter has simply spiced up the Pyramid Scheme with their own version, where they make the invalid claim that following more people will get you more followers and that getting more followers is an important part of being on Twitter. But how can having more random Twitter followers provide you with people who want to read what you are posting? It is my opinion that Twitter tells its users to follow as many people as possible because Twitter can then turn around and quote inflated usage numbers to its potential advertisers and charge more for advertising. Twitter can say, "When you look at our user statistics, you'll understand why our high prices are a great value to your business." However, how can advertising with Twitter be quality advertising, when many people and companies are following thousands of people and only read an extremely small amount of posts, including the advertising? What Are The Good Points Of Twitter? With that out of the way, there are some good things about Twitter because it's a self-publishing tool. Therefore, you have the ability to say exactly what you mean without any reporter or editor deleting information. In my opinion, one can make Twitter work better for you or your company with some training, planning and knowing some Twitter options which are available. 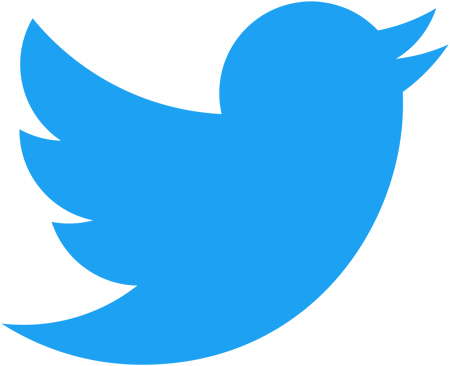 Here are some things about Twitter to help you be a better Twitter administrator. There are about 196 countries in the world and people also live in territories, sovereignties, islands, ships and remote outposts. This means that many people following you on Twitter might not live in your own country and don't speak your same language. Even if your company does little business outside of your own country, it's important to keep in mind that people from around the world are probably following your business and reading your posts and might one day be your customer. Try to be careful and reduce using slang and other words which might not translate well as the person's first language might not be your own. Try not use shortened words which don't translate well. If you use the shortened words "mfg" or "bldg," people outside an English speaking country won't know that "mfg" means manufacturer ands "bldg" means building. In addition, I would avoid the use of acronyms because they certainly don't translate well. Therefore, S-P-E-L-L-I-N-G O-U-T each word and make it easy for the translation software to do its job. How difficult can it be to type few extra strokes on the keyboard by spelling out entire words when the result means you'll have clearer communication most of your social media followers? Because there are 196 countries in the world, I'd I would always recommend to include the country of origin of your company for sales posts. This way, your potential customers have some knowledge where your company is located. If you are posting a news story, then post the country of origin for a news story. This way, people from other countries have a better understanding of the news story since they know where the news story is originating from. Keep in mind, people reading your posts will either know your company or don't know your company. If you want as many people as possible to feel like they are in the club, you'll reduce the number of inside remarks and inside jokes. Some of your Twitter followers will have been in your industry for years, some people will be new to the industry and some people might not even be in your industry. Or another way, when you write Twitter posts, assume most of your followers live in another country, speak another language, they don't know what your company is about and are new to the industry. This will ensure your communication is clear to everyone reading your posts. Know Some Of The Important Features Of Twitter. When you open a business Twitter account, remember to describe your company correctly, I'd list your city and country and include the link to your website. Possibly your phone number, if you have enough room. Go through the settings section of Twitter and check or uncheck settings which would work best for your company. When posting, you can write text, post links, photos, graphics, videos and take a poll. Taking a poll on Twitter is very easy to do and is something I'd recommend you do throughout the year if you are clever enough to dream up of an interesting poll. Be sure to keep a master list of polls you make each year. If you do this, you can eventually show the results of your polls over a 5 or 10 year period of time. You can use a hash tag in front of words like this: #helicopter. 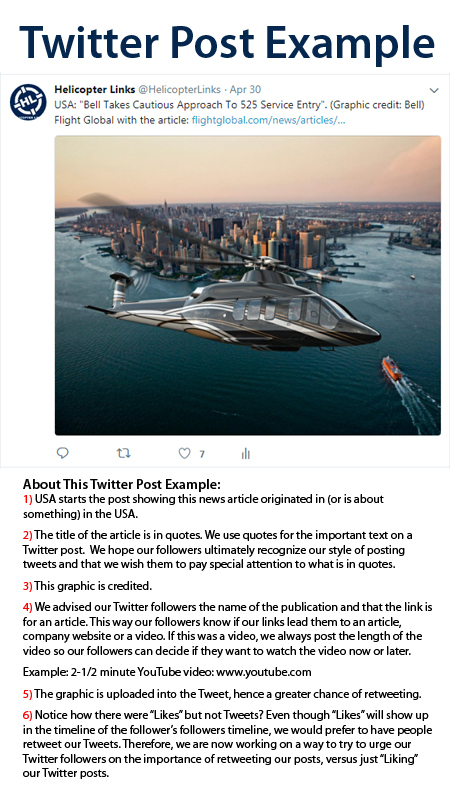 This helps people searching Twitter for the word helicopter and can help people find your latest Twitter posts. You can receive messages directly from people and send messages back to people through Twitter. If communication, is very important to your company, I'd make sure the option is chosen to allow anyone to send you a message through Twitter. You can also do your own research and read articles about the best methods to post Twitter posts. Remember, not all articles will have information that you like or find useful. Remember, it's easy for anyone to see if thought and effort was made for a post. If there is a lot of slang, mistyped words or you can't follow what a person is saying, then people know professionalism went right out the door. POST LINKS, LINKS AND MORE LINKS. If you are not putting links in your posts, you'll have many missed opportunities to have people contacting your company. MAKE SURE YOU HAVE A LINK ON ALL YOUR POSTS WHERE APPROPRIATE. I've seen authors and companies selling books, organizations promoting events, companies promoting products and service, but don't have links to their website. If you aren't posting links to promote your company or organization, why are you using Twitter? If your company is large enough, I'd would insist on using a professional writer for all posts. If you are a Twitter administrator, I'd always recommend before posting a Tweet, you write the entire text for the post, then re-read your post to make sure it makes sense, all words are spelled correctly, is grammatically correct and then post the Tweet. If you really want to be social, you post your name and title with each post. I've found that people will retweet a post with a picture more, than posts without a picture. Consider always posting a picture with all your posts. Remember, a picture is worth a thousand words. Keep an annual file on all the posts you've made. Dates, text, links and what graphics you used. This way, if someone wants to know what you posted throughout the year, you can print out a summary and hand it to them. We posted a total of 450 Twitter posts. The breakdown is this: 200 product posts, 200 articles, 34 jokes, 12 happy holiday posts, and 14 employee spot light posts. We had 35 emails from customers and 20 inquires from potential customers, through Twitter messenger. It's important to create your own Twitter posting standards to ensure clear communication. Some people might think they don't have much content to post about their company. However, I would disagree with this type of thinking. A social media administrator really owes it to themselves to understand how things how limited publishing items about companies were in the past. Before social media, the only way to get a company's information to customers and potential customers was to A) Publish a press release or write an article in some type of news media (magazines, TV, radio, newspapers) B) Have a mailing list and mail out a company made newsletter and/or flyer. Now that there is social media, any company, organization, famous personality or private person can post (publish) anything online without the help of traditional media. When one realizes that your company can post anything for the world to see without having to follow the rules, regulations and politics of traditional media, my hope is that you'll realize there will be plenty of subject matter for Twitter posts. Start with a plan. 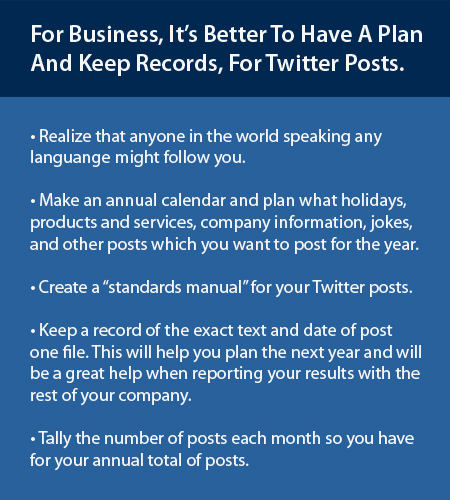 Get out a notepad and calendar and start with creating a list of things which you can post on Twitter for your company. In addition, keep a master list of the things you'll be posting so that you can repost them the next year and the next year and so on. Your first	year's	lists of Twitters posts will take time but it's worth the time because the next year will be easier to plan and post. If your boss wants a list of your Twitter posts, you can simply print the list. Your products. Take a picture of the products (or product group), write a description of what they are, how they can help customers, how popular they are, etc., and a link to their web page and presto! You've got content for your Twitter page. If you provide services, have a picture or graphic, provide a description of your services and a link to your website page which explains that service. When you are developing a new product/service and/or when a new product/service is made available for sale, this is a good time for a Twitter post. (And remember, you can repeat a new product/service post several times each month for however many months as you choose. Remember, you can always post your phone number in the Twitter post to make it easy for customers to call you. You can also post any particular web pages from your website throughout the year. If you have a historical section about your company, this is something that can posted on a Throw-back Thursday or on a Friday. You can post your contact page each week, to help people call your company. You can post pictures of the outside and inside of your corporate headquarters, manufacturing plant and/or hangars. You can post a small feature about different departments or employees in your company. You can post customer reviews or customer testimonials about your products and services. You are free to post any online articles about about your industry. You can post any event you attend such as trade shows or community events. If your company allows, you can post jokes throughout the year to help make things fun for your followers. Holidays. You can make holiday graphics for the holidays you feel are important. You can make a holiday graphic with a picture all your employees. It's cheaper than sending mailing out holiday cards. You can make all the holiday graphics at the beginning of the year so you'll be ready when Valentine's Day or another holiday comes along. I prefer to only make holiday graphics which are usually kept by many countries around the world. A holiday in your country might not be a holiday in another country. Create file folders and keep all your graphics by holiday, so you can easily find them and use them the next year. I live in the USA. Our independence day is the July 4th. I don't post any holiday graphics on July 4th because the USA is the only country who celebrates the 4th of July. I don't post Thanksgiving holiday posts because there are many countries do not have a Thanksgiving holiday, when we celebrate ours. Important posts might be featuring a particular product each week. When make a plan to feature products, services, manufacturing plant pictures, office photos (inside and outside), you'll find you can have plenty of Twitter posts to make each year. Unfortunately, when you have a Twitter user who is following thousands of Twitter accounts (which can include private individuals, celebrities, singers, TV personalities, etc.,) — these people are not the best candidates for people following your company. If you are honest with yourself, are these people actually going to see your posts and retweet your posts? The answer is probably no. And you can check to see if they are retweeting your tweets or other aviation related tweets. If not, you are probably safe to block these people. Blocking Twitter followers will give you a more accurate number of Twitter followers who actually want to follow your company. When businesses outside of your industry follow you (such as realtors, authors of books, religious organizations, restaurants, vacation rental companies, travel agencies, chamber of commerce organizations, convention centers, hotels and other nonprofit organizations), these are companies simply trying to gain Twitter followers, by following more Twitter accounts. These types of Twitter followers are most likely not interested in your company and will most likely never retweet your Tweets. I recommend to block most companies outside your industry which follow you on Twitter. It is okay to quickly check to quickly the profiles of each person and see who and how many people they are following. If you find a nutcase or an offensive person, block accordingly. Making guidelines on which people or what organizations you'll block, is a good idea. You can also message certain followers with thousands of Twitter followers and ask them if they are actually interested in your company or not. This might seem like an intrusive message to them on your part but 1) They did follow you and 2) Do you really want people who are NOT interested in your company, following your company on Twitter? Of course not. I'd use both Facebook and Twitter for your business. It is my experience that some people like Facebook better than Twitter and vice versa. I've had professionals tell me they only use Twitter for business and others tell me they only use Facebook for business. If your company uses both, then you'll hopefully post to as many people in your industry. I'd post the same things on Facebook and Twitter every day, this way, you are not wasting time and energy trying to decide what is best to post on Facebook and what is best to post on Twitter. If you are currently a Twitter user (personal or business), here's my advice. Go to your "FOLLOWING" list and start deleting all the Twitter accounts you really don't have any interest in. If that means deleting hundreds if not thousands of Twitter accounts from your list, that is a good thing. Only follow those companies, organizations and people you are really interested in. Do you want to follow some scientists, comedians, actors or TV personalities? Do you like to cook? Are you bicyclist? Do you have a favorite news channel? Do you have a favorite product? A favorite amusement park? Favorite airline? Are there companies that you really have an interest in? Do you have good friends who you really want to follow? These are the people/companies I'd recommend you follow. If you are following only 30 to 70 people, that's okay. Now go to your "FOLLOWERS" list. Do you have random people who you don't know, following you? Then block them! Do you have people pushing their own products or businesses who are following you? Block them. Only allow people who you want to follow you, follow you. I hope you start to realize the importance of blocking people who are out there trying to gain followers, just for the sake of gaining more followers. Why allow useless people and organizations follow your personal and/or company's Twitter account which simply results in not having an accurate number of Twitter Followers? How do you increase your Twitter followers for your business? Here are some ideas. Every email sent by every single employee should have your full business name, mailing address, country name, phone numbers, website and all social media accounts with their links at the bottom of each of these emails. If you have an email list, then add your complete company contact information, including links to all your social media accounts at the bottom of every bulk email. You can also email (or message through Twitter) those companies you do business with and ask them to follow your company Twitter account. Every two to three weeks, ask your followers to retweet your tweets. You can offer contests throughout the year, that when new people follow you on Twitter, they are eligible to have their names in a raffle to win a product, service or other type of gift. I hope this article helps. Remember, if you are using Twitter and you like the Tweet, that is, the Twitter post is something that interests you, please, please don't just "Like" it, retweet it!